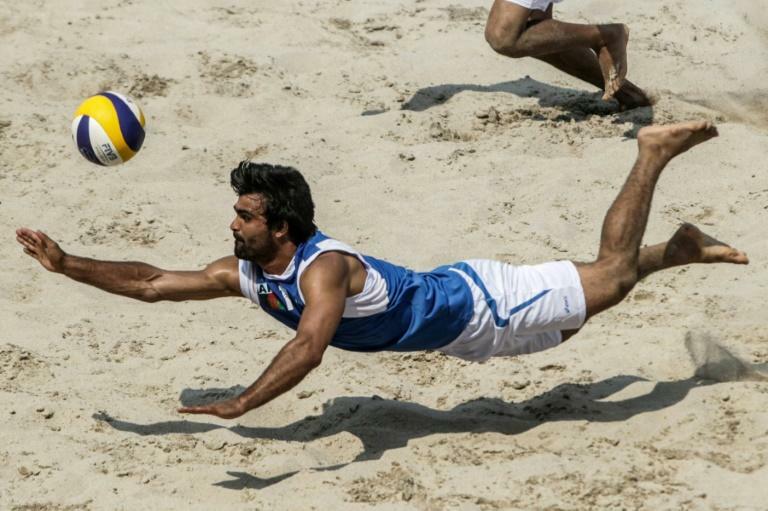 The Afghan men's beach volleyball team are more used to training in dust than sand -- but a predictable defeat at the Asian Games has not stopped them eyeing success at the next edition in 2022. The landlocked country with a distinct lack of beaches is not known for its prowess on the beach volley court, something the players hope to change. Neither of Afghanistan's two pairs won a single game of their respective three matches at the regional Olympics in Indonesia. But that is hardly surprising given their training conditions back home. "Afghanistan is a very poor country," coach Sayed Najib Sadat tells AFP after a shirts-off evening training session in Palembang's impressive sports city complex. The contrast with the facilities in Afghanistan, a country rocked by frequent bomb attacks, is stark. "Our players are not used to sand like this or the proper balls or net. We use indoor balls and our sand is more like dust," he says, adding that it is also too cold to play outside for nine months of the year. Football and cricket reign supreme in Afghanistan, although indoor volleyball is among a handful of other sports to have a strong following in the country. But beach volleyball is a new phenomenon. It only took off a few years ago and this is the first Asian Games for the squad of four players. They say they have been bowled over by the facilities in Palembang, and the general standard set by the hosts' volleyball federation. They did not come here with any expectation of medals, Sadat says, but hoping to build experience for the 2022 Games in Hangzhou, China. "We want to observe and learn which countries are taking part at what level here so that we are ready in four years' time." Heavyweight China has taken the lion's share of medals since the sport made its debut at the Games in 1998. But home nation Indonesia are also strong contenders. With its 13,000 or so islands the country -- unlike Afghanistan -- is not short on beaches. The Afghan team hope their appearance at the Asian Games will raise their profile -- especially if it means the International Volleyball Federation will step in to help solve their equipment woes. They also seek to spread the word about the sport back home. "Taking part in these matches is an achievement for our country," says 19-year-old player Mohib Jan Ahmadi, who partnered with Ozair Mohammad Asifi in the tournament. "We're doing it to encourage young people to stand up and shine in events like this to make our country proud."